The VST plugin am|munition is an extremely versatile dynamics tool for editing signal groups or sum signals, making it especially useful for mastering. It contains separate units such as compression, filtering, side-chain, limiter and clipper. You can also edit mid and side signals separately in M/S mode. All modules and parameters are optimized for compressing program material without disturbing artifacts, loudness gain, and analog control mode with individual sound signature. The transient designer has been developed specifically for detailed editing of percussive and dynamic signals. It's particularly suitable for optimizing attack and sustain parameters for drum or string parts. Among its other optimization mechanisms, am|pulse boasts saturation control and mix function due to its harmonic control mode. This fantastic combination of analog compressor and tape simulation is mainly suited to editing individual channels or sub-group signals. am-track features two completely different compressors, each with its own independent controls and sound characteristics. As well as the VCA mode, which covers the typical sound of modern VCA compressors, there's the Vintage mode, which uses an FET (field-effect transistor) element to create a more aggressive sound. In addition, the tape selection feature enables a tape saturation effect to be imitated, which catches soft transients and sends them through the "tape". This plug-in is particularly good for editing recordings of vocals and acoustic instruments. am|phibia is a combination of a tube preamp and channel strip that combines a high-quality opto compressor with a pre and post filter. It offers a whole new range of options for sound design. The Analog Modeling Suite Plus includes four high-quality effects plug-ins that model analog audio tools which simply can't be left out of any mastering process. This includes a high-quality analog compressor (am-track) with optional simulation of studio tape machine saturation effects, a transient designer (am-pulse) for influencing the signal envelope of percussive audio material, a tube pre-amp/channel strip (am-phibia), plus a mastering dynamics tool (am|munition) with compressor, limiter, clipper and M/S editing. 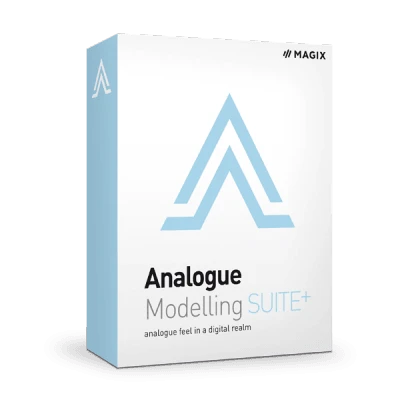 The Analogue Modelling Suite Plus is available as a VST plug-in.